There is the option of exporting both of them as a mesh object...but that drives the needed memory very, very high, at least to have good looking hair that doesn't look like it hasn't been washed in a couple of months. It would be nice to have a hair product that uses a generic curve that can be understood by a wide variety of programs...because, then, even without physics in DS, you could animate it in something else that does have physics. Below are 2 renders one with the opacity set to 1 and the other at 1.75. @Skiriki: Changed the lighting model and it seemed to help a little, though the hair still looked rather thin. Iit also introduced more fireflies during rendering. 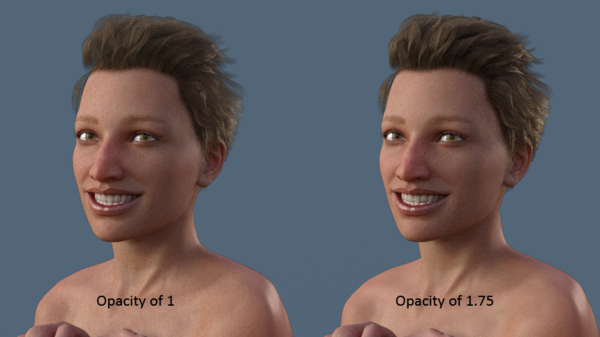 Osean Hair ismore of a "loose flyaway" style which is probably why has such a transparent appearance in Iray than others Also isn't the Lighting Model adjustment more for the benefit of 3DL as the settings no longer appear in the surfaces editor after converting a shader to any of the Iray ones? @Kamion99: Set the material for the hair strands to the Iray base material then reset the the Cutout Opacity to a value of 2 and yes, big difference. Looks nice and full now. I knew there had to be a simple solution out there. Thank you. Added a displacement map (basically the hair bump map) then set SubD to a value of 3 and the hair looks to have even more depth. Sorry if I got the wrong end of the stick on this; I thought Studio had multipass options so you could render using the standard 3delight engine to get the LAMH or Garibaldi hair pass, then composite it with the Iray render. Also isn't the Lighting Model adjustment more for the benefit of 3DL as the settings no longer appear in the surfaces editor after converting a shader to any of the Iray ones? Just a quick note on this; from what I can tell, the primary thing that the Lighting Model has, as an effect, is to change the way the material is auto-converted to Iray. So no, it's not useful in Iray, but if you change the Lighting Model before converting, the conversion will be different. That's the same way Luxus does it, too...I'd say Reality does something similar, but as I've never used it, I don't know. ...thanks for the explanation. Kind of did that by accident as I forgot to reset the lighting model before trying Kamion99's suggestion to apply the Iray material and increase the Opacity level. This particular hair, Asteria from 3Dream/Mairy, is used on a figure I created to represent a character in a series of books I'm writing. So it's really important to me to get it right, It's going to be on a number of book covers. There are four examples here, with different combinations of shaders and render engines. At this point, I haven't done anything else to the hair. I'm interested in getting opinions on which hair in the four images looks best. ACross, I hate to be a bother. Are the lights that different from 3DL and Iray? Have I been wasting my time the past week getting it remotely close, and failing completely? 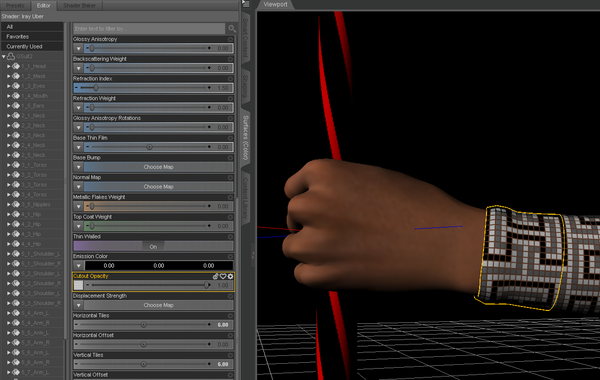 I know Iray is new to us all, and it will take allot of tinkering to figure stuff out. The hair dose look good to an extent. I noticed with my fumbling, some hair looks perfectly fine under some lights, and others just don't have the correct balance of translucency, gloss, and velvet. I'm afraid to say, something is just off with every one of them. a) somehow lacks depth to it. there is no shadows (in the hair), and it is to evenly light from what appears like everywhere. It looks like a crayon drawing of sorts. c) Same harsh edges with this one as well, that and the light is not casting shadows in the hair on the sides of the head. d) it looks like the hair is way to transparent, like a glass Greek statue. 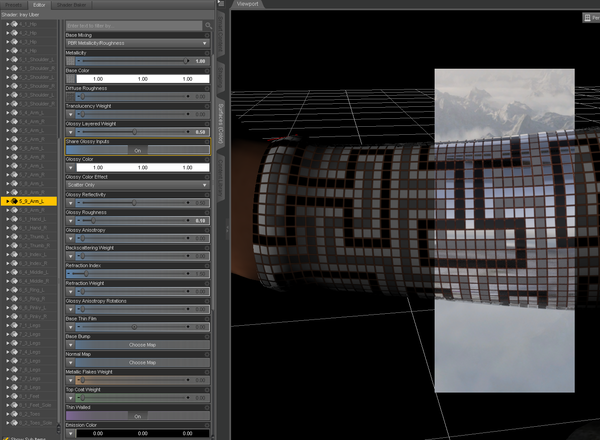 I've just started with the Iray shaders, and have had some "Stumble-onto" success with reflection only so far. It probably would not take so long for me, if it didn't take this computer so long to get a render good enough to make out what the settings are doing. Maybe a stupid question, but where can I find opacity in the Iray material? Peter.That is a very good question, I didn't get it in this screen-cap, tho it is used there on that map. 14minutes left on a render. I did notice when working on the staffs, that some dials act like switches to reveal others. "Glossy Roughness" in this one opened up a bunch more when I dialed it in. Only thing I could find in the documentation is 'Cutout Opacity'. Is this the parameter? yes. It is highlighted in this screen-cap. I hope it is not a "Thin Walled" option only. "O" as for hair, in this fumble around, it is far better then the skin mats. A new beta update is out, so some things may change to fix some problems. Surface normal for one is a big one for 3delight (front vs back of the surface), I don't know if it has any efect in Iray tho. I use opacity a lot when working with the 3Dlight shaders for temporary hiding some surfaces. Same there and the "Wisps" in front of the ears, lol. That is "Goddess hair" believe it or not. You're no bother at all. I'm just getting started and wanted to see what the renders looked like and get some feedback. As for the lights, I'm a total novice with this, in 4.7 as well as 4.8. With the Iray renders, I used the sun from Environment. With 3DL, I used a DistantLight. So, yes, the lights are quite different. However, image "D" already had the Iray shaders on the entire G2F, which made the skin look very different rendering with 3DL. 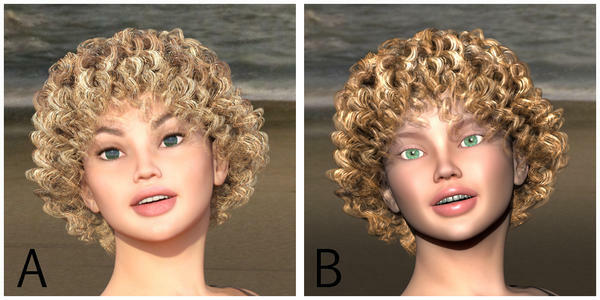 Image "B" was using 3DL shaders on the figure, but as you pointed out, the lighting wasn't all that good. But I only need a "ball park" idea of which is the best starting point. The actual hair I use on my character is shorter and a dark shade of red. I'm working with that now. (If you want, you can see the render I did for Christmas with two of the characters from the book here: http://lorraineadair.com/from-the-author/happy-holidays/) I was quite satisfied with the results I was getting for the characters. Even though they look "3D" the images will be distinctive on book covers. Then 4.8 came out... lol... Now I want to try to make them look more lifelike. Thank you for your feedback. I really do appreciate it. The modeling of the hair makes a huge difference. Some works just fine out of hte box, others, not so much. One thing we tried, mostly successfully for those hair that don't work out of the box, is to use two instances of the hair, scale one slightly differently (Larger or smaller depending on the hair) and add a little translucency. Instanced using the same maps should add little to the weight of the scene. The intersecting trans map problem is messing up some of my hair attempts, since a lot of hair models use fancy intersecting transmap stuff. Here's hoping NVIDIA fixes that before long! I'm not a professional but I like 'C' for the skin and hair, and 'D' for the eyes. I did mix the 2 in PSP but the save made a line of the picture for the first time ever so ? why that happened so won't post it. The eyes in "D" were photoshopped in using the eyes from "B"... lol Interesting that you liked the eyes from "D", but not from "B"! 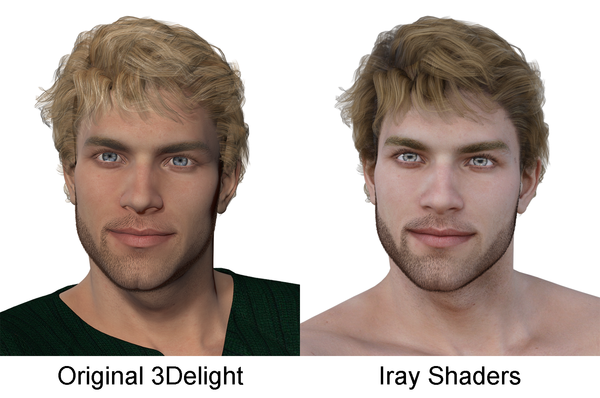 One thing I've seen mentioned time and again is how much darker eyes render in Iray. But it is probably accurate for real life. Ever notice how brown-eyed people seem to have black irises on tv shows or in the movies? Depending on what your image is for, I think you could fudge it a bit, and make the irises lighter using the shaders. Render tab, "Crush Blacks". it is at 0.2 by default, and dose the opposite of what it sounds like. 0.0 gives far better grades of dark shadows, the higher the number, the more brighter things gets crushed to black. 3DL vs Iray gloss may also be an issue as well. okay ... I've been trying to get the eyes right on some cats, decided to go with remaking some textures. About dark eyes in TV or movies ... yes, that's why the most popular actresses/actors chosen tend to be blue or light eyed people. I remember watching one show and it took awhile to catch "why" their guest actress always drew the viewer's eye ... they actually gave her "yellow" eyes, totally unnatural. Brunette with yellow eyes. Normally eyes also remain the same colour whatever they are. I had a co-worker years ago whose eyes would actually change colour depending upon her mood. You could watch them change colour and when they were 'green', look out, she was "mad". When 'normal', they were a very mixed hazel type. I use Micah Hair from AprilYSH for a character, Jason Dalton, in the book series I mentioned in an earlier post. I had already modified the transparency map to make it look less solid and more like hair. And with a bit of tinkering, it looks very good in Iray. As this thread is about how to make hair look good, I spent some time documenting what settings I was working with and how they affected the hair. For this, I used the standard blonde mat for Micah Hair. 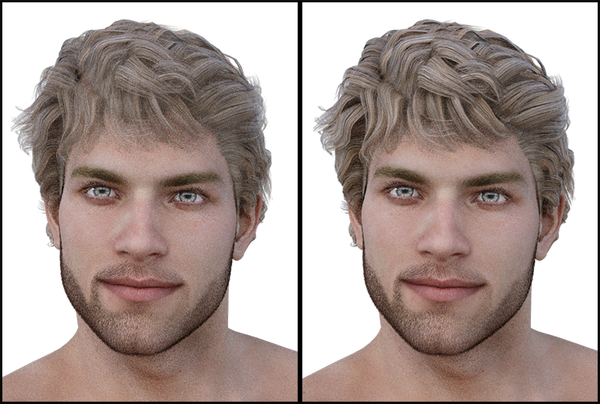 The first image below is a side-by-side comparison of Micah Hair with the default Iray Uber Base shaders applied on the left and then with the Cutout Opacity set to 1.75 on the right. As you can see, the base shader does a pretty good job of converting Micah Hair. It's pretty usable as is. Exaggerating the Cutout Opacity, on the other hand, leaves Jason looking like he's addicted to hairspray. I played around a lot with the Base Color and ended up leaving it as is. But it was pretty fun to make it a bright blue. And it really showed where the Base Color is applied, and how strongly. Another thing I've seen in various threads of the forum is how using translucency leaves areas of the hair white. That is a function of the Translucency Color, which is set to white by default when you set Translucency Weight to anything but 0.00. Early in this thread, Hellboy mentioned setting the weight to 0.5 and using th same color as the hair. I think the right weight to use may be dependent on the hair object. I liked the effect of 0.25 on Micah Hair. Any higher and it didn't look good to me. I think the white is too extreme, but both the black and tan colors seem to work well as the Translucency Color for the blonde hair. 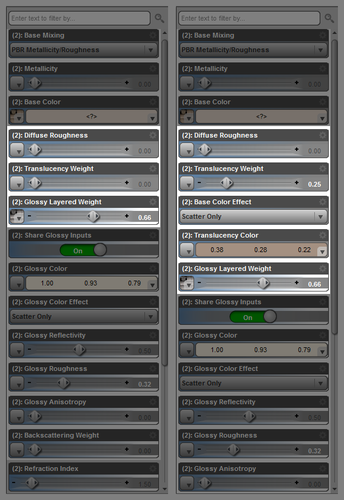 Until you set Translucency Weight, the other settings for translucency are hidden. (This is true of a good number of Iray options.) The third image is another side-by-side comparison, showing the editor settings both before and after weight has been dialed in. The uninspiring lighting setup was intentional, and included the sun node assigned to a DistantLight directly in front of the figure and a photometric spotlight on either side pointing behind the figure. For the translucency tests, another photometric light was directly behind the figure pointing to the back of his head. (Doesn't seem to have made any difference in the hair, though.) All test renders were cancelled 10-15 minutes into the render, before the images reached 1% convergence. Thank you, I hope to be working on some hair later this week so can give it a try. @ ACross - Thanks alot for your advice! It helps me out with the RievelHair. On the first image on the left I used the default Iray shaders. On the other images I changed the Cutout Opacity levels. Image 2: Decreased the scalp to 0.5 and encreased the hair up to 2. Image 3: Decreased the scalp to 0.1 and encreased the hair up to 3. Image 4: Decreased the scalp even more, to 0 and left the hair at 3. As for the "scalp" it looks like the best setting is in between 0 and 0.1. No other changes were done. Wow. The hair looks best with the higher Cutout Opacity. Even though it looks more plastic. The default doesn't look like hair at all! ...thank you. this works great. BTW to reveal all the controls you can click on "Show Hidden Properties".